Last week I made the decision to adapt a wheat free lifestyle. Thankfully, this isn’t because of a severe gluten allergy or celiac disease. I do have a new appreciation for those with wheat allergies and/or severe gluten issues. Wheat is in as much, if not more, stuff than HFCS. Makes you wonder. I made the decision because of my own research, my own cravings for wheat based things which keep me constantly battling my food addictions, and the fact that wheat is not a great thing for my diabetic husband. Additionally, the tummy problems I do experience (bloating, discomfort, cramping) typically occur after eating wheat. Because my husband and I had such great success with the Whole30, we decided to give this Wheat Free living a try. Today makes day 13, with only one hiccup in the journey. I did break down and have some pizza at that rehearsal dinner I mentioned last week. It was AMAZING pizza. We aren’t talking Pizza Hut or Dominoes here. They had specialty pizzas with things like butternut squash on them. They had a “Thanksgiving Pizza”. I can’t even remember the names of the other pizzas, just trust me, it was AMAZING pizza. Because I don’t have any severe reactions to wheat that would cause illness, keeping my kitchen wheat free doesn’t involve having to buy new utensils, bake ware, or searching to remove every last trace of wheat. It does mean that the bags of flour are now used up or donated, and I didn’t buy anymore bread last week. It also means re-stocking the kitchen with a new assortment of flours and taking time out of my day to bake. I decided for my schedule, the best thing to do was to block out a few hours on Monday to bake a few loaves of bread for the week. Over the weekend, I also made a “sweet bread”. I thought this would help the boys to not feel “deprived”. I even made Wheat Free waffles and Wheat Free onion rings. 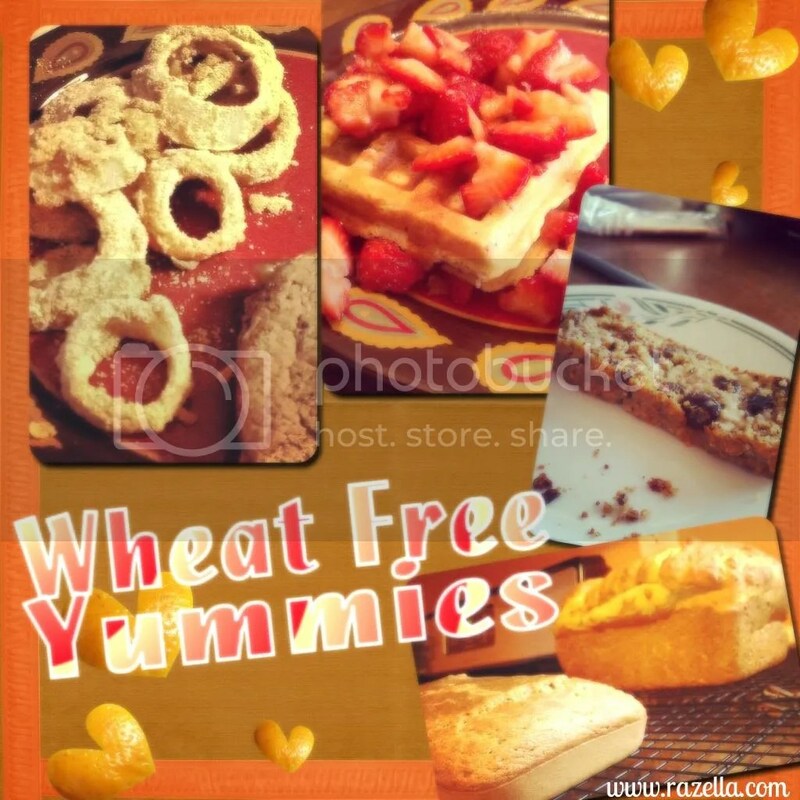 So how did all those Wheat Free things turn out? Onion Rings: The batter was predominately made up of almond and coconut flours. While it smelled amazing, it did not crisp up as I had hoped it would. They were still delicious enough for my family to eat without complaint. Very flavorful. May try this again to see if I can get it to crisp, if not, may try a different wheat free approach. My only dislike – it feels like such a waste of flour for what’s leftover. Considering how much more expensive these flours are to use, I may try to figure out a way to bake something with the leftover flour next time. Waffles: This is made predominately using almond meal and ground flaxseeds. For waffles, I added more milk than the recipe originally called for to try and get the batter more liquidity. Because of the thickness, it won’t spread out on the waffle maker. So I scooped it on, then quickly spread it myself before closing the waffle maker. Cooked nicely and had a very hearty/grainy flavor. I opted to top mine with fresh strawberries cut up and mixed with a little all natural sweetener. Sweet Bread: Made using walnuts and raisins, because these are both items I can buy in bulk at Sam’s and therefore have some on hand for making more. This uses mostly almond flour and ground golden flaxseed. The raisins give it a touch of sweetness and the flavor of the bread is very “holiday happy”. We enjoyed it as an afternoon snack. Loaves of Bread: The smaller loaf is made with almond and garbanzo bean flours, and ground golden flaxseeds. It is dense and very flavorful. It tastes like it has it’s own sweetness to it. My family loves it plain or with a little peanut butter on it. The larger loaf is made using Bob’s Red Mill Homemade Wonderful Bread Mix. This uses yeast and the hardest part for me is not over heating or underheating the milk before adding the yeast to it. It has a good flavor that isn’t as “hearty”. It’s a dense, cake-like texture. It’s great for sandwiches although if you add too many wet ingredients (tomatoes, condiments, etc.) it’s more likely to crumble and fall apart on you. We just pull out a knife and fork at that point and continue enjoying it. The rest of our meals have looked more Whole30ish than not with dairy added in. My husband and I also have a breakfast shake (that is gluten free) in the mornings for breakfast made with a glass of soy milk. While it seems that soy is under the gun again for possible health issues it could cause, we love the flavor with our morning shakes and the protein punch it packs. It’s also the only time we drink/use soy during the day. This week I am feeling like I did about my second to third week into the Whole30. I’m consistently finding myself with more energy and feeling “better” overall. The icky bloating feeling is gone. I also find that I’m not craving food in-between meals. I feel satisfied from one meal to the next like I did on the Whole30 which is fantastic. I contribute this to the overall healthier meals and the more nutrient dense breads we are now eating. Did I mention too, even my nearly twelve year old son LOVES all the breads I’m making? Fantastic! So how did I do on my goals? Elliptical: Nope. HA! Second week in a row I didn’t touch the thing. However! I did two days of Jillian Michael’s 30 Day Shred. This upcoming week I think I’m changing the goal to exercising at least 3 times total this week. Who knows, maybe one of those will be on the elliptical. If not, that’s OK by me, I just want to get back into regular exercise. Drink Water Before Coffee: Absolutely! It’s becoming a habit and I feel better first thing. I’m also doing great at NOT drinking coffee after noon most days. If I do have a cup after noon, it’s at 1 or so with 2 being my absolute cut off. Going to keep this up until I feel confident it’s my new habit. Small Daily Health Goal I Pray About Each Day: Yes! It’s truly a blessing to give my victories and struggles to the Lord each morning. This is a great way to hold myself accountable every morning and I love the fellowship I have with the Lord in this area and other areas of my life. So how does this all look in the numbers? All recipes this week came from the book “Wheat Belly Cookbook” by William Davis, MD. Join me at Intoxicated on Life for Wellness Wednesday. Great place for all sorts of nutrition information and host of Wellness Wednesday Link Up! Join me at Kim’s blog for the WIW link up. Let’s encourage one another towards our health and weight goals! Although I certainly haven’t gone wheat free, we are reducing what we eat. I know what you mean about the bloaty feeling, and often times I am finding too much upsets my stomach. By limiting what I intake and staying to the healthier side of carbs, not only did I have good loss this week, but I do feel better. And realized as I was reading your post, I’ve felt better and haven’t had any stomach issues! Bonus. I am going to continue to focus on that a little more this week and see how I feel. Great informative post, by the way! You did awesome this week! I think the sweet/sugar of bread can make us crave more of it than we need. So limiting it is a plus, and if you see that your body feels better without as much of it, then I say do what makes your body feel healthier! For us, it’s just removing it altogether. 🙂 Thanks for stopping by! I hope you have another fantastic week! I love how you ended this post! Drawing closer to the Lord puts everything else into proper perspective, including what we eat and how active we are. Thank you for the information on the wheat free kitchen. I have no problem with wheat and love whole wheat products in moderation. But my hubby often complains of the symptoms you mentioned after eating some meals so I may want to try some recipes without wheat to see if he feels better. Thanks for the information. And I do appreciate that we can encourage one another and hold each other accountable. Yes, keeping everything in proper perspective is always important. You are most welcome, I am all about sharing whatever I can with the experience I have in this health journey. After three days of being truly wheat free, my husband notices a difference too in how much better he feels being wheat free. I say it’s always worth experimenting to find what is going to be the healthiest options for you and your family. 🙂 And I really enjoyed your post about discipline today! Great Post and thanks for linking up….. I think it’s so key for us all to find what works best to help our bodies operate at maximum capacity. Good for you to do that! And you are RIGHT…. most important is keeping our eyes on the Lord! Thanks for hosting! And finding out what our bodies need to be properly fueled, or sometimes what they don’t need, is half the battle. Amen to keeping our eyes on the Lord! This is great, RaZella. I’m on day 12 of my first Whole30 and, while I’m not feeling FANTASTIC following the program isn’t nearly as hard as I thought it would be. Encouragement from you and others who’ve blazed the trail is so helpful. As for the onion rings, check out everydaymaven.com – Alyssa has a great recipe for oven-baked “fried” chicken using almond flour and almond meal. Her ingredients and method might be applicable to other “fried” food makeovers. Glad to hear you’ve been able to make some GF treats. Are you going to share your recipes?! 🙂 I used to every once in a while sneak pizza in, but lately I’ve found it’s not worth it. I didn’t used to have any abdominal pain, but now if I even get a little bit of gluten my body protests and I end up laid out for 24 hours with cramps. I see this as a good thing (not the laid out part) because it shows that my body has begun healing and it does NOT want wheat added back in. And I do plan on sharing recipes as I come up with different things or my own recipes. Right now, all of the recipes I am using are from the book “Wheat Belly Cookbook”, and not wanting to risk copyright issues, I’m not posting those recipes until I know exactly how/if I can. I do highly recommend the book for the recipes if nothing else because there are a ton of great recipes in the book!